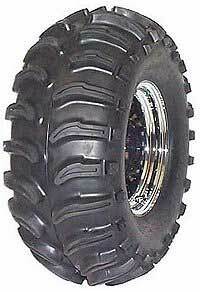 Super Swamper ATV Tires Reviews and Best Deals. The Interco Super Swamper ATV tires were designed to be effective in sloppy conditions while still having good performance on hard packed surfaces. A smooth ride was also on the priority list for this do-it-all ATV tire. Pronounced side lugs were sacrificed to allow the tires to slide easier in turns. It does hurt the Super Swamper's ability to hook up in deep ruts. You won't find much traction until the tire bottoms out. Traction seems more than acceptable in surface mud. Maybe due to the reduced sidewall lugs, the steering seems to take less effort than many other all terrain tires. The ride is noticeably smoother. The 22" thru 25" sizes sport a 13/16 lug depth which should reduce the power needed to spin thru most mud. Down side is less traction in the thicker stuff. The 26 and 27 inchers have a more serious 1" lug. As usual these larger sizes are intended for ATVs with bigger engines and more torque. The bigger size Super Swamper four wheeler tires are some of the heaviest so you'll need that extra power. According to owner feedback the tires have good wear and are highly rated overall as an all terrain tire. Mud performance was good other than soft, deep ruts. The 6 ply rating provides the toughness. Super Swamper ATV Tires - Conclusion. If most of your riding is rocky or hard packed with some surface mud thrown in - the Super Swamper tire should be on your short list. Deep ruts seem to be the only thing that causes problems. A riding area full of those would probably mean a pass on the Super Swampers. Check out our custom link for the best deals on the Interco Super Swamper Tires. Our links are programmed to update automatically so you always see the best deals available. The Super Swamper Vampire ATV tires are a much more mud oriented tire. The Vampire EDL (Extra Deep Lug - 2") is a favorite among mud bog racers.